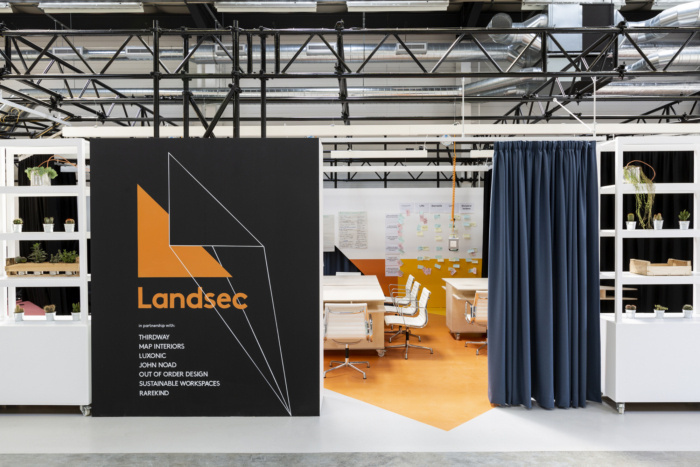 ThirdWay Architecture designed the pop-up lab and offices for the UK’s largest commercial property developer, Landsec, located in London, England. The brief for Landsec’s 1300 sq. ft pop-up Lab was to create ‘somewhere different’ that clients and staff could use as a workshop space to showcase new ways of working, collaborating and thinking. The requirement was for a multifunctional, innovative and importantly flexible solution to achieve the best possible working space while allowing for The Lab to be connected to or divided from its warehouse setting. With it being a temporary structure and an opportunity to think more innovatively, the budget was modest and a large proportion of it ring fenced for furniture and M&E elements. Designing a space that met the financial restrictions and still ticked every box within the brief was a big challenge. ThirdWay’s vision for The Lab fundamentally focused on creating a space that was completely adaptable to different users and uses; a stage set if you like. This flexibility was achieved by rethinking the necessity of static furniture and physical space divisions, questioning the way things work and what we could do differently.